Would you ride on a driverless bus? There'll be no arguing with the driver on this bus. After all, the rides are free and there's no driver, anyway. Trikala is a rural town in northern Greece. It has been chosen to test a driverless bus in real traffic conditions for the first time. The test is part of a European project. Its goal is to revolutionize mass transport and wean its cities off oil dependency over the next 30 years. Trials of the French-built CityMobil2 buses will last through late February. 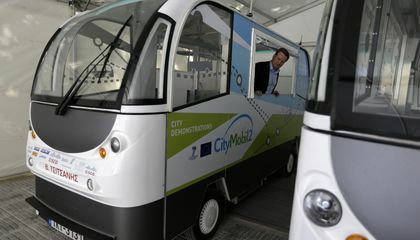 Over the past year, CityMobil2 has been tried out near its base in La Rochelle in western France, on a campus in Lausanne, Switzerland and near Helsinki, Finland. Each site provides controlled conditions. So there were no accidents. But Greece is a country of narrow, winding, hilly streets. It has stray dogs, bicycle riders and impatient drivers. The buses are up against real traffic. The Greek government had to amend its laws to allow the testing. And the city had to build a dedicated bus lane. It deprived residents of downtown parking spaces. The robot buses don't look like science fiction vehicles. They are more like golf cart meets ice cream truck. Still, heads turn as the skinny, battery-powered buses hum through the streets. They seat only 10 people. Each is guided by GPS and additional sensors. The sensors include lasers and cameras. They send live data to a control center. The buses go no faster than 12 1/2 miles per hour. But the trials in Trikala (pronounced TREE-kah-lah) potentially represent a major advance for automated transport. "There were cities bidding for this project all over Europe. They offered relatively restricted urban areas. But we said we could make it happen in a downtown environment and we won," said Odisseas Raptis, who heads the city's digital project department. It is called e-Trikala. "We have a 2.4-kilometer (1.5-mile) route, the bus route. It's mixed with traffic, with pedestrians, with bicycles, with cars. That hasn't been done before." Vasilis Karavidas is the chief technician for the project in Greece. He trained with Robosoft. They are the company that developed the bus, in the southwest French town of Bidart. Although the driverless buses are fully automated with onboard navigation and obstacle detection systems, each vehicle will be monitored by a driver in the control center. That individual can override the system, Karavidas said. "It's as if they are in here and they can stop the bus if they want to, if something goes wrong," he said. The buses are currently running without passengers. Full testing will start later in October. That's when a fiber-optic network allowing faster data transmission will be completed. Six battery-powered vehicles will eventually be used in this farming town of 80,000. The town has become hooked on high-tech. Trikala already has already tested EU-funded pilot medical programs. They include schemes to relay heart test data from home to the doctor's office and use tracker devices for Alzheimer patients. In the center of the city, a "digital tree" with solar panels allows benches to carry phone-charging outlets. Senior transport analyst Philippe Crist works at the International Transport Forum. It is a think-tank based in Paris. He says transport trends are hard to predict as the world moves more toward automation. "We too often look at technological changes in isolation," Crist said. "There is a good chance that these technologies will create entirely new uses that we can only poorly grasp today. The reality is that everything is changing around these technologies. And it is plausible that society may lose interest in owning cars or using fixed-service public transport. Especially if these technologies allow better alternatives to emerge." Models run by the think tank suggest that city transport could be made massively more efficient. Crist said researchers looked at "shared and route-optimized on-call taxi-like services replacing all car and bus trips in a mid-sized European city. We found that these systems could deliver almost the same mobility as today but with 95 percent fewer vehicles." Driverless cars and buses offer an easier way to optimize traffic flow while aiming to eliminate human error. That has transport developers working at both ends. They are adding automatic features to conventional vehicles while raising the bar for those that will have no driver at all. "I think it's wonderful. Think how many people will come to Trikala to see this. It's new and innovative," he said, moments after a driverless bus passed by. "It reminds me of the toy cars my grandchildren play with." Are zombees a doomsday for bees? What advantages does a driverless bus offer? The advantages of the driverless bus offers no payment,no arguing with the bus driver,does not make loud noises,and has solar-panels for phone-charging outlets. I would love to ride in this bus because I want to try something new and exciting,I also like the fact that it is fit for ten people so I could talk with my friends in the bus without feeling uncomfortable. I enjoyed reading this article because it told me a little bit about the lifestyle in Greece and I really want to go there. 1. Some advantages that a driverless bus include would be the fact that it would eliminate human error, and that it would make traffic more efficient, as this technology is developed. 2. I find the article interesting, as this technology is the forefront of the technology we will be using almost entirely in 10-20 years. We already have cars like the Google cars that are being tested to be driverless, and at this point, the only issue left to be tackled is the integration and mass production. It was a very very long passage about a driver-less bus in Greece that I found very interesting but it also seemed very dangerous to me. But if they get rained on would it mess it up and crash. It will make it easy because people will not arguing with the driver.And it is a bad thing to because people will have less jobs. Its pretty cool that were making robot cars but tech is not reliable because they can get viruses and things like that. I think it is kind of a bad idea because it could have a glitch without you knowing it.It could be good for blind people so they can go somewhere alone sometime soon. I think this articles very unreal but surprisingly very true grown ups sometimes get tired from driving all day but now grown ups can get some rest from driving. that is a good i dea. 1.The advantages of a driverless bus are endless, for a start human error would be non-existent, hence less car crashes. Since it would be free more jobs will be taken because of a presence of transportation unlike before where some people couldn't get a job because they had no reliable way of transportation. 2.I am completely for this, there is little to no disadvantages to this. I believe this is a great idea because I have a job and sometimes my way of transportation is late, making me late so with this i can get a ride to work no matter what happens to my first way of transportation.